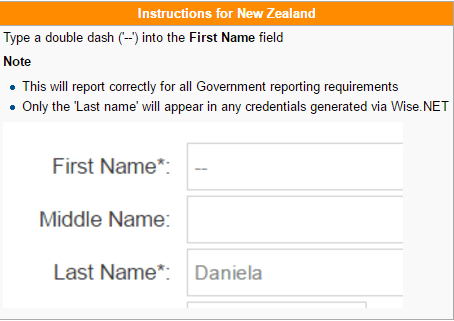 To avoid errors with reporting it is important that Learners with only one name are entered in correctly. For AVETMISS National standard (and any states that claim to use the national standard e.g. 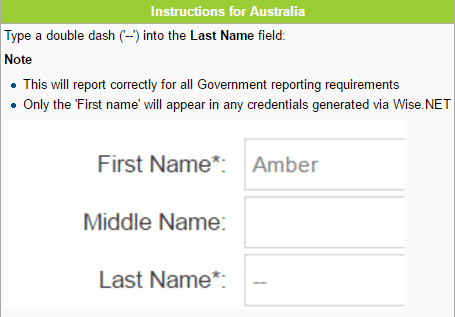 NSW), if the person only has one name, it will be reported in both the first name and the last name (family name). For AVETMISS , the name appears in the NAT85 and also appears in the NAT80 in a condensed form as ‘name for encryption’. If you have entered ‘-‘ or ‘–‘ in the last name, those dashes will not display when you run a credential for the Learner.